Ready to start earning up to 8% cash-back on every single thing you order on AliExpress for yourself, or on behalf of your drop shipping customers? We know it's exciting (especially when you begin to filter products by the cash-back amount). All those bonus earnings add up quickly to increased profit margins and revenue for you, every month! To get started, you will have to complete a one-time sign-up process through Admitad. But you must click on the link while inside AliExtractor, or your cash-back settings will not be verified as part of our exclusive bonus program. The process should only take you a couple minutes to complete, but it must be done in this order to register for your cash-back incentives. Important: You must go to the Admitad signup page through AliExtractor. If you go directly to the Admitad website, you will not be approved for cash back. 1. First, click on the Settings icon in the top right corner of your AliExtractor window. 2. Next, click the "Cashback settings" button. 4. You will be taken to the page below. Click "Join". 5. On the sign up form, fill in or select the appropriate information for each box. For "Login" and "Password", create a username and password which will be associated with your Admitad account. When you're finished, click "Continue sign-up". Note: "Your level" indicates how much knowledge you have of affiliate marketing (Beginner, Basic, or Advanced). Choose the right one for your level of affiliate experience. 6. Now you will enter the details of your online store or website. You must enter the URL of a website that you own, as it will be verified later in the signup process. Click "Continue sign-up" when you're done. 7. You should see the following confirmation message. But wait! There are a few more things to do before you are approved as a Admitad Affiliate. 8. You should have received an email from Admitad that contains an activation link. Click on this link. 9. 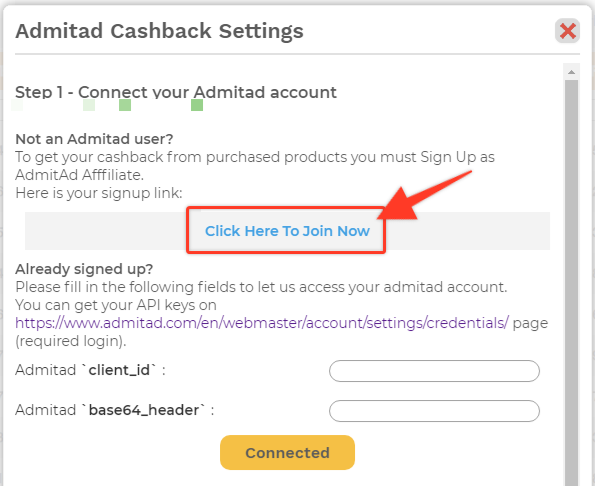 In order to start earning money with Admitad, you must validate that you are the owner of the website with which you signed up. You can do this either by copying and pasting code or by loading a file into your website's root folder. 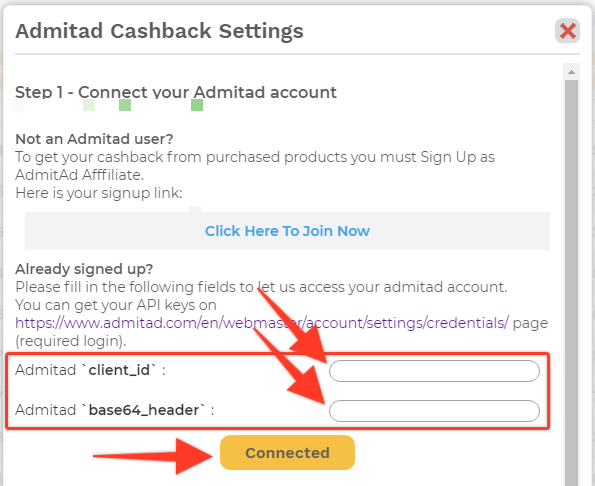 Now that you are an Admitad Affiliate, you can connect your account to AliExtractor and start getting cash back! 10. Click the link below to retrieve your API code. 11. 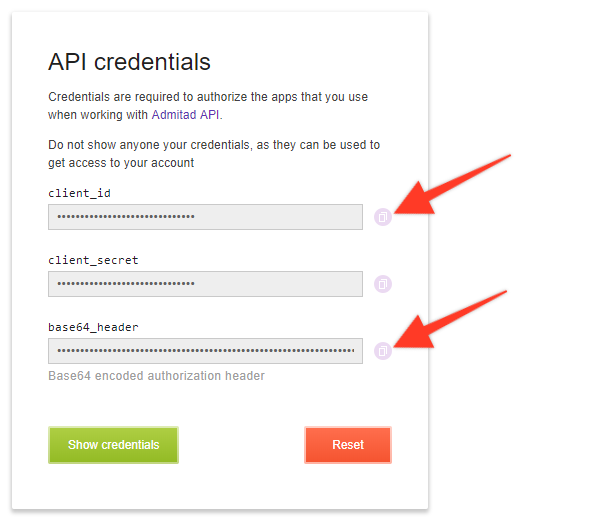 From your Admitad account Settings page, click the "API and apps" tab, then click "Show credentials". and paste them into AliExtractor, then click "Connect" at the bottom in AliExtractor to complete the signup process. AliExpress can take up to ten (10) days to review and approve your affiliate status and request. AliExtractor members must make sure that their ecommerce store is live (you must have a website to be eligible) and social media account during the registration process. If you do not walk through all the steps, or if your site is not live, your request may be rejected by AliExpress, and you will have to go through the authorization process again. Take it slow, follow our step-by-step instructions, and once you receive a confirmation email from AliExpress, you will be ready to start chalking up the bonus cash-back incentives, on every product you sell and order.